If you are interested in classes or tutoring, please email or call me. My class sizes are deliberately limited so I can concentrate on teaching art to my students. I interview and request a portfolio or journal from my students to see their level and what their interest lies. It is best to request information and get on my student list so I can work you in before my schedule is full. Starting Saturday May 4th, from 9a-12p, at Tulsa Christian Center Ministries, 8920 E. 31st St. beginning drawing and painting classes will be offered for grades 3-5 (9:00 a.m.-10:00 a.m.) and 6th-8th grade (10:30-12 noon). High School classes will be offered in the afternoons from 12:30- 2:30. 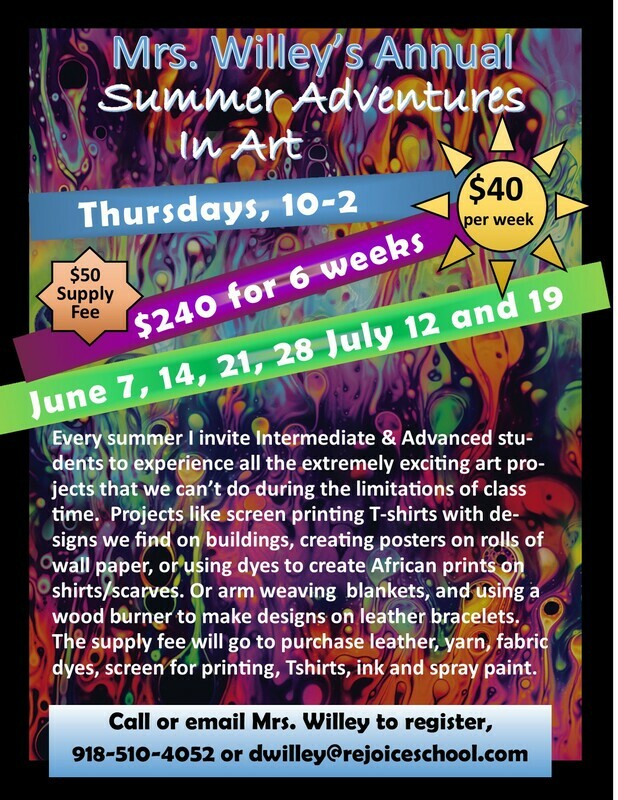 Exciting and fun classes in watercolor, acrylic, charcoal, pastel, graphite and colored pencil; all fine art projects to develop the artist within, not just the final project. Or email me at Information.ArtAcademy@gmail.com. In the meantime, I am offering one hour segments of Artistic Tutoring and Instruction, on Wednesdays and Thursdays from 4:30-6:30. Drawing, portraits, landscapes, painting, watercolor, acrylics, oils...true artistic training and creative development. Weekly sessions to help you develop and become the artist you have always wanted to be. Have you always wanted to have a new hobby, but you just don't know where to start, call me to arrange for artistic tutoring, the cost is $25/hour.